Take Exit 1 on the Hibiya Line platform, and walk straight to the corner, with the first traffic light. Turn left and walk straight. After about 50 meters you will cross a small bridge. Continue walking and you will pass a Doutor coffee shop on your left. Cross the street and walk straight for another 50 meters. You will see a Pronto cafe on the right. Turn left at the next corner and immediately cross the street. The Ishibashi Building, a narrow 7-story building, is second from the corner. 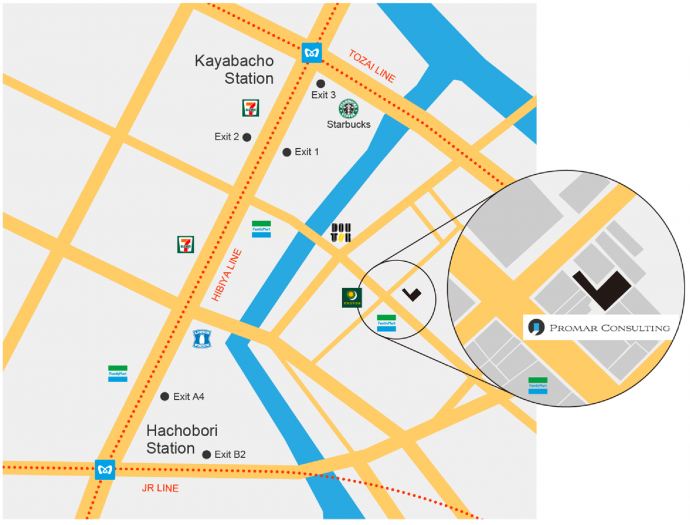 Promar Consulting offices are located on the 4th and 6th floors of the Ishibashi Building.